Arrival: Pickup, Hotel drop Our tour guide will pick you up from Nedumbasseri International Airport and will drop you off at hotel in an A/C Car. Our A/C car will be waiting for you at the airport. It will drop you off at the budget hotel of your choice. An extensive shopping/evening harbour cruise of Cochin. 8:00 - 13:00 An extensive sightseeing of Cochin will start with a visit of the Jewish Synagogue. Hill Palace is another attraction followed by museum and Mattanchery Palace. 14:30 - 6:30 Travel by car to Munnar. check-in at hotel/rest of the day at leisure or shopping. 8:00 After breakfast our car will pick you up from the hotel. Guide will be available for package 1 and package 2. 7:00 After breakfast our car will pick you up from the hotel. Guide will be available for package 1 and package 2. 11:00 - 13:00 Periyar wildlife sanctuary visit. 14:30 Evening go for boat cruise in the lake to watch wild animals. 8:00 AM After breakfast Proceed to Alleppey, Known as the Venice of the East. On arrival check into a traditional House Boat of Kerala Style. 11:00 AM Cruise through the back waters is the fabulous way to explore the fascinating beauty of the backwaters. Stay overnight in the House Boat. On either side see the local life is its positive totality - The coir makers, the fishermen, the coconut pluckers, farmers and boatmen. You enjoy fishing from the boat and your lunch (seafood choices) is served in the boat itself. Lunch will include the fish you have caught in local curry flavors. "Green Palm" rated houseboat (More on Government ratings). The Pongala Mahotsavam is the most important festival of Attukal Bhagavathy Temple. 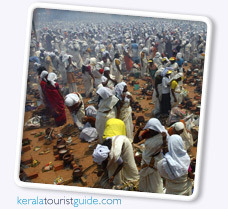 The offering of Pongala is a special temple practice existing in the south Kerala and Tamilnadu. In Attukal temple, the Pongala Mahotsavam is a ten-day programme which starts on the Karthika star of the Malayalam month of Makaram-Kumbham (February-March) and closing with the sacrificial offering known as Kuruthitharpanam at night. The number of women offering Pongala is increasing each year, and is expected to be the largest event in world where the maximum number of women gather together on a single day. The temple's name was published in Guinness book of Records, for being the world's largest religious union of women.